Anna Feigenbaum discusses the history of tear gas as crowd control. 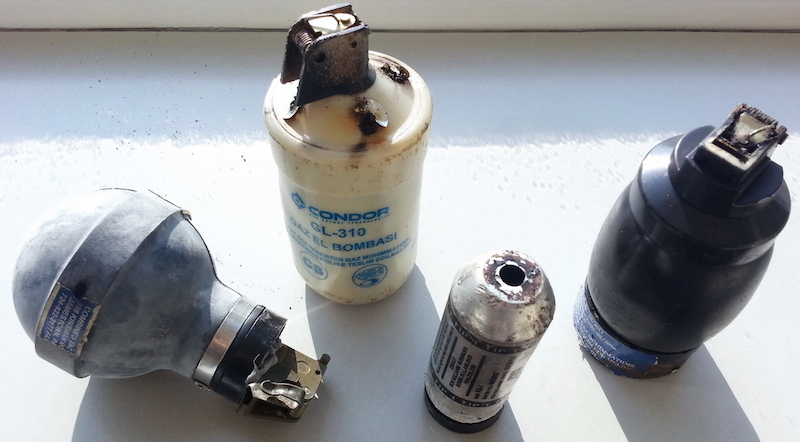 Tear gas shells collected in Istanbul, 2013. via Wikimedia Commons. This interview was first published in Open Democracy. Tear Gas: From the Battlefields of WWI to the Streets of Today is out now from Verso and on sale for 30% off. Anna Feigenbaum: While tear gas has been around since just after the First World War, it was really during the Civil Rights Movement, and the global unrest of the 1960s, where we saw it become the kind of go-to weapon of choice for riot control, and where we really saw riot control come together as a field under that name. This process is often historicised as the global rise of passive resistance — so, in combination with the rise of Gandhi/independence movement-style tactics. But actually, if we look at the situation more carefully, we see it’s more about what we would now call the rise of the diversity of tactics. So, you had lots of people who were peacefully protesting at this time, but you also had Antifa- and Black bloc-type actions coming into play. And I think it’s actually that mix, as well as more traditional-looking riots in the US at that time, with the race riots, that led to the formation of riot control. And in the European context — France, in particular — you have the rise of a much more militant, union-organising activism at this time, which the police weren’t really prepared for. So, you started to have these kind of spectacle situations in which it looked like the police couldn’t control or handle the protests, and they started coming under a lot of pressure by the government for not being able to properly control the situations. My colleague Justin Murphy has actually done a quantitative look at the rise and fall of militant action, and you see this real peak of what we would define as miltiant activism in the late 60s and 70s, but it's after that that we see a dip, not before. I think the bigger issue is that you started to have a lot more television crews at protests, and so these scenes were being recorded and fed into people’s homes and the police all of a sudden really needed to win this PR battle over the street. And so the combination of a diverse set of tactics the police don’t know how to control, and also lots of cameras in their faces, lead to this kind of crisis of street policing. So you see this big rise at the end of the 1960s and early 70s in the formalisation of what we now call riot-control tactics — which are in part drawn from military tactics and trainers, and in part from colonial policing, which is always a mix of militarisation, occupation and more traditional law enforcement. So, you have this crystalisation that happens at this time, and a lot of money is put into the development of additional less-lethal weapons. Then, in the 1990s, in part because of NATO funding and the shift to more humanitarian modes of intervention across the military and law enforcement worlds, which are a shared economy, you then see a big search in global players in this marketplace. So, lots of countries that weren’t in the business come into the business, and you start to see tear gas being used as a policing strategy in countries that are sort of modelling their police restructuring after the West. So, the East African countries, Southeast Asia… Brazil becomes a really big player and you start to see companies beyond those in the US and Europe developing their own tear gas. Right now, Condor Non-lethal Technologies, in Brazil, is one of the biggest manufacturers. And then there’s Rheinmetall Denel Munition, which is a South African and German joint venture. And then you’ve got Korean and Chinese companies that are coming onto the scene, often selling to East Africa, the Indian subcontinent, and the Middle East. And now you have these transnational networks between these companies so that they can cover as much of the world as possible, the same situation as with any kind of international business. They’re finding countries that weren’t using these weapons before. Why is your book particularly focused on tear gas over other crowd-control weapons? The idea of riot control is really more about regaining control of space than it is about gaining control of individual bodies. And tear gas is the most emblematic of that — it’s about "atmosphere governance." After tear gas, other weapons get developed under the same logic. So, sound weapons: "How else can we pollute the area? Let’s make intolerable sound." With skunk it’s "Let's make intolerable smell." So this idea that we can actually fill the atmosphere with something that makes it impossible for people to maintain their solidarity, to maintain their collective mass, that forces people to break apart. Some of the archival quotes are very telling in terms of the initial reasons for the development of tear gas. The idea is to make the mob look silly. It’s this big PR move, too; you create the riot by using riot control. What are you main concerns when it comes to the use of tear gas as a crowd-control weapon? First is the medical concern. Like other products that have been pushed by military, government and corporate interests — compare the situation, for example, to the history of cigarettes — there is a really biased science behind it. When tear gas was evaluated in the 1970s, it was following this idea that it should be thought of as a drug and not as a weapon. So they were measuring the human threshold, the dose that you could give someone without killing them. That kind of logic, to be applied to a weapon, to a toxic chemical, is very troubling from a medical perspective. They excluded from this compilation of studies all kinds of incidences where people had died [in real life situations], because they were only using clinical trials to make that assessment, and mostly clinical trials on animals. They weren't taking any epidemiological or sociological factors into consideration, so anytime that somebody had a negative response or got injured they blamed the person for other aspects of their lives e.g. that person was a smoker, that’s why they reacted so badly to tear gas. So you have this really dodgy science, and also few long-term studies — for instance, [no studies] in places like Palestine, where people have been tear-gassed sometimes every week, or at least every few months, for 20 or 30 years of their lives. There is also very little study into other things that are major concerns, like miscarriage. The most recent study on this was done in Chile after the 2011 protests there, and the government actually paused use for a while because the study suggested that there was this link between miscarriage and tear gas. And anecdotally all of the human rights groups in countries that are regularly tear-gassed have said that tear gas causes miscarriages. But the clinical trials don’t show that. The European Respiratory Society has also looked at studies that show that there are long-term respiratory concerns. All these major medical associations around the world have all come out with statements that say we do not know enough about the effects of this. It’s also often the manufacturers that fund the trials that do take place. If we’re going to test tear gas as a drug and not a weapon then it needs to come under the same standards as pharmaceutical testing, which means declaring conflicts of interest, and legal repercussions if you fail to do so. So the studies refer to tear gas as a drug, but it is still bought and sold under the "less-lethal weapon" label. How does this work? They play both games; they win that way. The idea that tear gas can be safe is premised on it not being a weapon — at least, not in a traditional way. Less-lethals can only make sense as something somehow benevolent if we believe in the fundamental logic, which is the same logic as torture. We don’t think of torture as being benevolent, but we’re using the same logic: how much pain can we cause somebody without causing whatever point of harm is no longer seen as humanitarian? So, how toxic can this be without making somebody choke to death? How loud can it be without making someone go deaf or bleed from the ears? When you actually look at the studies, especially the ones done on animals where there’s no benevolent language, you just get a list of which animal died, which animal didn’t die but suffered the most, and you’re just reading this and the basis of it. Tear gas is a weapon — it’s sold and traded by the arms industry — but they’re very careful to adopt this kind of technical language that pulls us out of thinking of it as chemical weaponry. The second concern is the corporate perspective linked to this — the fact that we have all these people who are making money. We have this corporate interest, where the corporations are setting the training guidelines, doing the training, profiting off of the weapons they sell. It’s often a package deal: "we will give you this big lot of police weapons and the training to go with it." So you’ve go this huge business where there’s a vested interest in using more and more of these weapons and in escalating force, because the more force escalation we have, the more of these weapons are needed. Police reform is so focused on the relationship between the protester and the police, but we forget that there is this whole for-profit market that is driving that relationship between the protester and the police. And so part of the project for me in the book is to make visible the corporate interest in the escalation of force. What we need in terms of activism is to bring the question of profit and the question of who benefits from the escalation of force into our discussion about police reformation. We need to trace the money. And then the third track is that you have no market regulation. There’s nothing on a national or international level that makes people have to record the use of these weapons, how many people get hurt, how many people die, etc. And there’s no real open regulation of trade. If a government is trading to another government, that has to be openly documented; but you can have a company trading to a government that has a prearranged agreement where it doesn’t need to be in the public eye. You can also have a company trading with another company, and countries or companies or police departments selling stuff to each other. The NGO that I work with, Omega Research Foundation, just found some documentation about Israel reselling some of its old products. So we have this completely unregulated marketplace and unclear international conventions. The only real international guidelines we have are UN guidelines, principles for the use of force — but they’re not backed by anything. It’s a legal mess. Where would we need to start in terms of creating international regulations for crowd-control weapons? At the moment, we don’t even have enough empirical data to make evaluations. So first we need public disclosure of all trade. We also need a duty for law-enforcement agencies to record all uses of force on civilians. Until we have those two pieces of information, we have no grounds to begin to ask questions such as "How much is too much?" The other thing that needs to be recorded, which is often not recorded, is why these weapons are being used? My research team in 2013 and 2015 used media reports to map use of tear gas around the world. In 2013, we were just recording the instances along with little summaries of what happened, but then one of the things we realised was that a lot of times tear gas was being used in situations such as "people want water," "people want fuel," "there's an election happening." So, protests for fundamental human rights, basic tenets of democracy that the police are tear-gassing people for, not riots. The number of instances that actually look like a riot or that have any evidence of civilian violence make up an incredibly small proportion of the times that less-lethals have been used. So, in 2015 we decided to record [a more detailed] reason for why tear gas is being used and it was quite telling in terms of how many of those times law enforcement was turning to weapons when people were making claims for basic human rights, basic tenets of democracy to be met. Another thing that’s very troubling is the increasing use of less-lethals, and tear gas in particular, as border control, particularly in ad hoc border zones where there are not formal walls or fences and security guards. So we’re seeing this in the migrations through Europe, such as in the camps in Calais, where less-lethals are being used as ad hoc security infrastructure. How can police training be improved when it comes to use of crowd-control weapons? The question should be what can be fixed without use of less-lethals. I'm quite partial to the argument put out by Alex Vitale in The End of Policing that the problem with policing is policing itself, that the reformist gestures can’t get at the underlying problems. But in the interim of that, I think that the companies providing the weapons should of course not be doing the trainings, and that there needs to be independent and humanitarian bodies that are involved in the training process. We need more training in conflict negotiation, a greater understanding of mental health conditions, and actual humanitarian responses to many of the issues people protest about, particularly when it comes to things like water shortages, flooding, borders, that have clear and well-established protocols for how to respond in an actual humanitarian way. Because we’re not often talking about responding to a protest that is aimed at taking down the government or something where the state actually needs to protect itself — the number of times that that happens is actually very, very small.